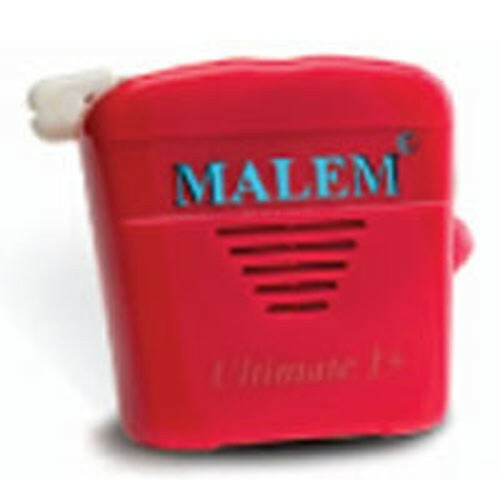 Malem ULTIMATE Recordable Bedwetting Alarm is a highly customizable bed wetting alarm for children. This alarm allows you to record a personal message that will play back upon activation of the alarm. The alarm will record your own voice message to your child such as “Johnny, it is time for you to go to the bathroom.” In addition to recordable sounds, this bedwetting alarm has two other sensory alarms—visual and touch. The visual alert involves a flashing light. The touch alert is a vibration emitted from the alarm that the child can feel, alerting them to awake and go to the bathroom. The vibration alert is not available when using the custom recording alarm function. Malem Recordable Bedwetting Alarm is adaptable to special needs children. The recordable function will record up to 10 seconds. When the alarm is activated by sensing moisture, the sound will play or loop continuously until stopped. The recording can be changed daily or as often as desired. All types of sounds can be recorded to meet individual needs. This alarm is also very useful tor daytime wetting. The Recording Bedwetting Alarm, unlike other bed wetting alarms, requires no sewing, no metal clips, no snaps, no mini pads and is essentially hassle free. The bedwetting alarm sensor should be cleaned with soapy water and a small brush weekly to remove urine residue. The alarm sounds continuously until the sensor is removed, allowing the parent or the child sufficient time to effectively respond to the alarm. Multi-Alarm Warning Device: provides sounds, vibration and flashing light in response to moisture. Easy-clip sensor attaches to outside of briefs. Brightly colored alarm unit to attract the interest of children.